Youth crime in the United States remains near the lowest levels seen in the past three decades, yet public concern and media coverage of gang activity has skyrocketed since 2000. Fear has spread from neighborhoods with longstanding gang problems to communities with historically low levels of crime, and some policy makers have declared the arrival of a national gang “crisis.” Yet many questions remain unanswered. How can communities and policy makers differentiate between perceived threats and actual challenges presented by gangs? Which communities are most affected by gangs, and what is the nature of that impact? How much of the crime that plagues poor urban neighborhoods is attributable to gangs? And what approaches work to promote public safety? This report attempts to clarify some of the persistent misconceptions about gangs and to assess the successes and failures of approaches that have been employed to respond to gangs. We undertook an extensive review of the research literature on gangs because we believe that the costs of uninformed policy making—including thousands of lives lost to violence or imprisonment—are simply too high. Los Angeles is a case in point. Author and former California state senator Tom Hayden reports that thousands of young people have been killed in Los Angeles gang conflicts despite decades of extremely aggressive gang enforcement. City and state officials have spent billions of dollars on policing and surveillance, on development of databases containing the names of tens of thousands of alleged gang members, and on long prison sentences for gang members. Spending on gang enforcement has far outpaced spending on prevention programs or on improved conditions in communities where gang violence takes a heavy toll. Los Angeles taxpayers have not seen a return on their massive investments over the past quarter century: law enforcement agencies report that there are now six times as many gangs and at least double the number of gang members in the region. In the undisputed gang capital of the U.S., more police, more prisons, and more punitive measures haven’t stopped the cycle of gang violence. Los Angeles is losing the war on gangs. Absent better information, lawmakers in the nation’s capital and across the country risk blindly following in Los Angeles’ troubled footsteps. Washington policy makers have tied gangs to terrorism and connected their formation and growth to everything from lax border enforcement to the illicit drug trade. Federal proposals—such as S. 456, the “Gang Abatement and Prevention Act of 2007”—promise more of the kinds of punitive approaches that have failed to curb the violence in Los Angeles. 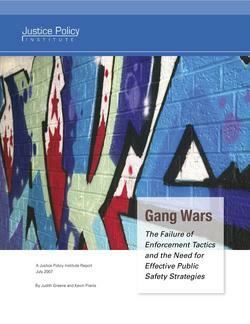 Gang Wars presents findings from an extensive review of the research literature on gangs and the effectiveness of various policy responses to gang problems. The following conclusions may surprise those who follow the public discussion on gangs.